As it was in the 30's - thro' young eyes. It was in the year 1935, when I was 5 , and as with all little boys and girls the world was a frighting but exciting place to find ourselves in.Our particular worldwas especially so, I suppose, because the ‘Garden City’ had appeared just across the back field and was clearly visible through the line of elm trees in the middle distance. We were the villagers of Hatfield Hyde. We were Cochrane’s Coal of ‘the row,’ Lower Hatfield Hyde.This string of row houses began with the Woodman pub and ended with Walbies Shop. Where we lived in the row was eventually cleared to make way for the Upperfield Rd./Cole Green Lane junction.I often ponder why I remember so clearly the world of those days.I mean the families, for instance, starting from that den of iniquity,the Woodman- the Sams,Thrussels,Piggots,Golders,Houlton,us,Mrs Birch, Cochrane’s (cousin), Den Burton’s and that lot I was forbidden to play with, the Swallows. 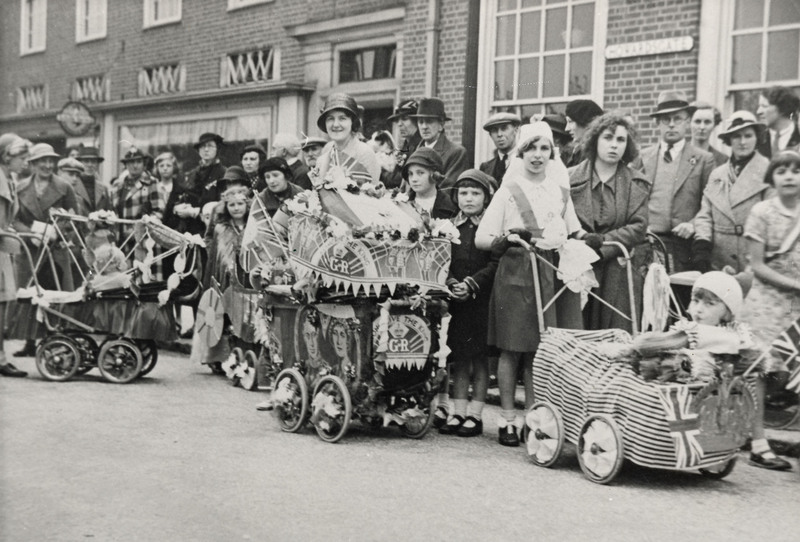 —–I was a small boy,being hustled along beside my brother,(who was lucky enough to be in the pushchair) on a typical Saturday afternoon outing to the Welwyn Stores 1929 Ltd.The early part of the trip was certainly a trial for Mother; past Walbies, to meet thebeginning of the ‘CINDER PATH’. This was our only link to the Garden City.Onlyabout 1/4 mile in length but wheeling on cinders is hard going.On to the gap in the hedge that brought us onto the deadend of Ludwick Way (Salisbury Rd. marked the city boundary).Now, this gap in the hedge was the equivalent to a breach in the ramparts of a medieval castle to my mother. My father and uncle were mostly to blame,I admit,as several times a day they drove horses and carts carrying tons of coal through the gap,turning it into a quagmire.Do not get your shoes muddywas the order of the day.The pushchair, empty at this point, was my mother’s problem! On to the stores by way of Ludwick Way,Hyde Way and Bridge Way East.There were many wonders yet to come. First,there was the Welwyn Builders railway.Seemed to us to run all over the place.A light railway,with about a 36 in. gauge; a tramcar driven by a petrol or diesel motor pulling waggons with tipable hoppers like wedges of cheese on wheels. The engineman sat sideways which I thought strange.It was a thrill when one came along.A remaining part of this track could still be seen well into the 50’s ,cutting across the old Stanborough Rd. at the place where it entered the gravel pits. Later,as a Handside schoolboy, I enjoyed very exciting and very DANGEROUS fun on the gravel washer, the tarmac machine and brickwork machinery in this area.How did we get away with it ? But that’s another story. –I well remember on that very wet day in 1935, the diamond jubilee of King George V and Queen Mary, walking along Broadwater with our Ludwick school class to the Match Factory where we had a party in celebration.We came away with a mug having a picture of the King and Queen on it—We were wet through!.Did they actually make matches there,by the way?. Now on down Broadwater to Bridge Rd. East.At this corner, the Welwyn Foundry’s smelter came into view and sometimes we would see the sparks and flames shooting from the chimney— very impressive to a 5 yr.old.In later life as an engineer, MIMechE, I found out what was going on in there—I’m still impressed. Up Bridge Rd., past Dawnay’s and the cranes to the right, the arch of the Shredded Wheat gate to the left, and ahead Hunters Bridge. I often wonder if it was named for Hunter the farmer of Handside,who my great grandfather traveled from Scotland with,as his farrier. Now comes the most looked-forward-to part—if my mother hadn’t been extra careful, we would be on the bridge when an Atlantic Class express would come roaring through in a torrent of smoke and steam that because of the lattice openwork of the walkway, would seem to be threatening to take us with it. So much for that! All that a boy of any age would want! Now, down the bridge to the highly respectable Cherry Tree on the right and Jenner Parsons on the left. 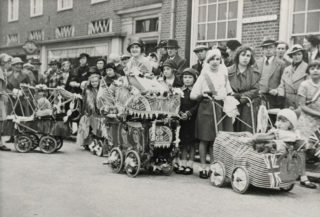 But perhaps at this time it was Tim Birkin’s garage as I do recall catching sight of something I know now as a racing Bentley on one of these excursions beside the pushchair. Now next door, opposite the Police Station, stood Munts, a shop full of all that a boy of any age would want. There were bicycles of every description and much else besides especially at Christmas. The overhead windows giving the place a very airy atmosphere, the creaky hardwood strip floor and the smell of— I don’t know what, made it a boy’s heaven’ ——and the city center was’nt there yet,from Munt’s to Parkway was an open field. A footpath ,very muddy, made its way forward. There was fun on the way though; a pipe sticking out of the ground usually sprayed water all around. Mud! that was what living in or near this vision of the future was all about. Eventually we arrived at the Welwyn Stores(1929) Ltd, with those funny shaped lamp-posts,but we were more interested in the windmill pedlar in the street. He was usually there holding up a sheaf of straw into which the windmills were stuck, in their different colours of celluloid, all turning in the wind made a wonderful impression on the children like us. It still seems to me that,though we badly wanted one, they still looked better in the sheaf. On into the interior of this wooden trestle roof building, not at all like English places we were used to! Looking back today, that building appears more Californian and probably was. I wonder if any one can help me in this next somewhat cloudy reminiscence—-a small crowd of shoppers were standing one day, by the marble counter where the man in a white coat patted up the butter looking up at what I remember as a live monkey sitting up in the wooden trestles of the roof.Worrying my mother about it did not satisfy me at all at the time, so it remains a mystery to this day! The long walk home may have taken us by Welwyn Bakeries where the smell of bread baking would almost overpower the smell of Shredded Wheat———but then, not quite……. So ends the outing to the stores,circa 1935, just in time for my Mum to get Dad’s supper…. This page was added on 16/09/2011. You mention the Woodhall shop of D C Wenk. I think that this was an electrical shop. John Wenk of that family was a good athlete and represented GB in the 800metres at the 1960 Rome Olympics. I have thoroughly enjoyed reading the above, and it bought back fond memories of my childhood, living in the Woodhall area. Although born in 1948, I recall my Grandparents telling me of them moving from Barnet to Welwyn Garden City and living in Peartree Lane (circa 1930) before moving to Gooseacre opposite the Woodhall Shops (circa 1944). Through those hazy childhood memories, I recall the shopping parade only going as far as what is now the underpass that leads up to Longlands Road. Some of the shops as I recall were Daisy’s Hairdressers, which had a little marmoset monkey in the shop. Next to this was DC Wenks. There was also a sweet shop called McConachie’s (spelling), a Butchers and a Grocery store (later taken over by The Co-op. Next to the sweet shop, on the end, was a shoe repairers’ run by Runchman and Jones, who also, if I recall correctly, had a shop on the old Great North Road near the Bull at Stanborough. In those days, the milk was delivered by Horse and Cart, and the milkman’s horse was called ‘Horace’. I also recall the Grocery wagon that stood on the corner of Sandpit Road by the Community Centre, and as kids we used to hang around in the hope we may get a bit of fruit when he was packing up for the day. My parents, along with my sister and myself, lived with my Grandparents in Gooseacre, until we moved to a newly built house in Great Ley in 1949. On the junction of Woodhall Lane and Hollybush Lane, opposite the Peartree PH, was a Children’s Nursery, and a row of cottages that stretched up as far as what is now the junction of Great Ley and Hollybush Lane. These were demolished circa 1955, and the building site was a great place for us ‘kids’ to play, until the new houses and the 4 story flats were built. Behind the Community Centre were allotments that stretched up as far as the old wooden structured Congregational Church that stood opposite the junction of Great Ley on Woodhall Lane. In 1959 these allotments were taken to build Our Lady Queen of Apostles Catholic Church. My grandparents lived at first at 20 the Row and Grandad worked at Dawneys for 48 years. Other family members lived at Sandpit cottages. The Burtons (Den etc ) were my fathers cousins. I remember my dad mentioning Walbies! It was lovely to read this. I also grew up on the East Side on Cranborne Gardens off Knella Road, and after a stint in Barnet and Yorkshire in the 60s and 70s returned to Welwyn Garden to Ludwick Way then to our current house on right round the corner from the home I grew up in. My parents used to work at Welwyn Department Stores and at Murphy Radios as I was growing up. I too remember the smell of the Welwyn Bakery on Bridge Road East, and the Shredded Wheat factory where my aunt worked (after her & Uncle Teddy married and returned to Hertford in 1947). Our bread always came fresh from the Welwyn Bakery store at Woodhall, which Fine Fare took over in the mid 50s. About the prefabs, there were prefabs at the car park near Welwyn Stores which were occupied by a few elderly people. I do remember the prefabs on Wellcroft Road, when we walked down to the Woodman on a Saturday we used to pass the prefabs. They were in rows and looked so boring – I say that, my parents lived in a prefab behind Welwyn Foundry before moving into their home on Cranborne Gardens. Yes, you’re right. Walby had a shop in Hatfield. I suspect the one at Hatfield was the original. I thoroughly enjoyed reading the above article. Although I was not born until 1947, my Dad, his siblings and parents lived at one of the cottages (the one near Walbies end I believe) My Dad (91) and his brother (93) still live in WGC. My grandparents moved from the cottage to Longcroft Lane where they lived until they could no longer manage being in the house and moved to a flat in Raymonds Close. My grandfather died aged 93 in 1973 and grandma died aged 88 in 1974. The article brought back many memories for me as a year after I was born my parents and I moved into one of the prefabs in Wellcroft Close and used to do the long walk from there over to Town. I thoroughly enjoyed going into Munts and in fact my 3rd birthday present was a small tin pram from there. Of course I wanted to push it all the way back to Wellcroft Close so Dad accompanied me while Mum went home by bus!